You are here: Home / ColaLife Scale-up / What is self-sustaining development? 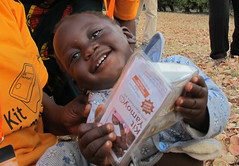 The Kit Yamoyo diarrhoea treatment kit under production in Zambia for the local Zambian market. 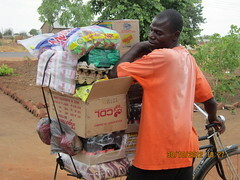 The kit was designed and the local market developed using one-off donor funding. It is very common to hear the term “sustainable development” in international development discussions. But what does it mean? The phrase can be used interchangeably, to mean one of two things which are, in fact, very different. Some use it in the sense of “living within our environmental limits” or development that “meets the needs of the present, without compromising the ability of future generations to meet their own needs.” Others use the term to describe development that carries on once the resources used to create it are removed. I refer to this form of sustainable development as “self-sustaining development”, to distinguish it from what one might call “environmentally sustainable development”. Over the past eight years, I have been involved in ColaLife in Zambia, an initiative to transform access to the globally recommended treatment for childhood diarrhoea. It is early days – donor funding only finished 12 months ago (Mar-18) – but all indications are that the transformation we achieved while donor funds were flowing will be self-sustaining and are even developing further. So, how does one achieve development that is self-sustaining? Here are some principles I have developed over the years while working with others on development projects that I think are crucial if you are to achieve self-sustaining development. Plan for it from the outset. You don’t achieve self-sustaining development while being forced to come up with “an exit strategy” two years before donor funding comes to an end. Build a smart partnership to guide planning, testing and scale-up. Smart partnerships gather around a shared vision not around an organisation or an individual. Be open and inclusive: invite everyone in, as part of a process where a broad membership can self-select their level of engagement. Some may go on to become implementation partners, while others may continue as a broader consultative group. Do everything through local systems and structures. Where these lack capacity or direction, help build the capacity, help refine or improve the direction. Above all, avoid setting-up parallel systems or structures. Self-sustaining development should fit with government policy. If it doesn’t, seek to better align plans or work with government to influence or advocate for change. Engage your intended beneficiaries from the very outset. It is better to operate on the basis of what you know people want, rather than on what you think they need. Don’t do anything that makes you or your organisation a permanent part of the solution. Avoid creating dependency on your funded project or intervention. It should catalyse: create a solution, without being a permanent part of that solution. I am sure that these principles could be usefully refined and added to.